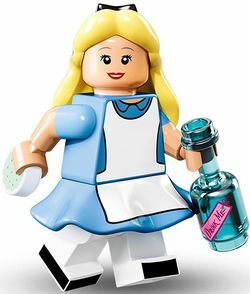 Alice is a Disney Minifigures minifigure released in May 2016. Alice is a girl who falls down a rabbit hole while picnicking, entering a nonsensical dreamworld called Wonderland. This is a description taken from LEGO.com. Please do not modify it. Following a talking White Rabbit down a rabbit hole has led Alice on a most unexpected and unusual adventure to the fantastical world of Wonderland. On her journey, she meets strange characters such as the Cheshire Cat, celebrates unbirthdays at the Mad Hatter’s tea party, and even crosses paths with the angry Queen of Hearts. Following a talking White Rabbit down a rabbit hole has led Alice on a most unexpected and unusual adventure to the fantastical world of Wonderland. On her journey, she meets strange characters such as the Cheshire Cat, celebrates unbirthdays at the Mad Hatter’s tea party, and even crosses paths with the angry Queen of Hearts. This page was last edited on 10 February 2019, at 00:17.